Seventy Seven is another notch in Kim Newport-Mimran's fashion bedpost. Opening today, the Yorkville concept boutique will become the first flagship for her Pink Tartan line, and yet another impressive bullet-point on her resume. No wonder she's one half of arguably the most influential couple in contemporary Canadian fashion. I have a confession. I pretty much love everything that the Mimrans touch. Club Monaco, Caban, Joe Fresh - need I go on? Did you know that Newport-Mimran even designed the adorably retro uniforms for Porter Airlines? The pillbox hats actually prompted me to apply for a flight attendant position. I wish I were joking. On the heels of husband Joe's splashy Vancouver Joe Fresh flagship launch, Newport-Mimran is boasting a new achievement of her own. A stunning historic building at 77 Yorkville Ave will house Pink Tartan's new 2-storey lifestyle boutique. Aptly named Seventy Seven, after the prestigious address, the concept shop has a newly made-over interior (by acclaimed designer Diego Burdi). 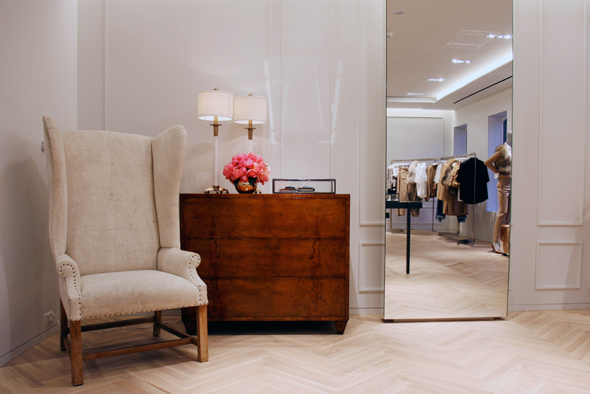 Newport-Mimran wanted the aesthetic to mimic the feel of her New York and Toronto residences. Much of the artwork in the space is even borrowed from her homes. Pink Tartan, the 8-year-old designer line, finally gets some breathing room. While it is already carried by the likes of Holt Renfrew and Saks Fifth Avenue, the line will now have some much-deserved dedicated space. 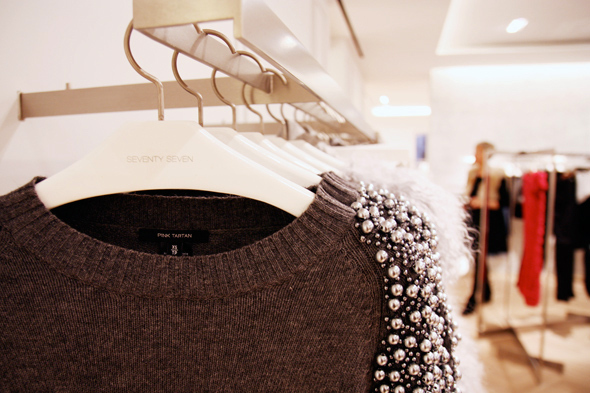 Seventy-Seven will showcase the Pink Tartan line in a significant way, along with choice complementary brands and an edited selection of lifestyle products. 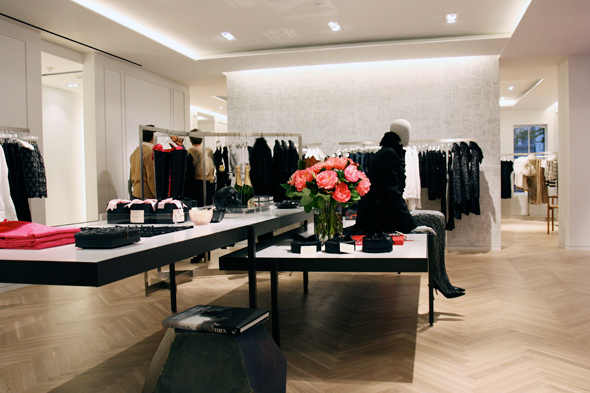 During a sneak preview this week, Daniel Booth, visual stylist for Pink Tartan, whisks me through the shop. Upstairs, racks of Pink Tartan frocks and pieces from the holiday collection are given reprieve by select items from Paul Sinclaire and Acne denim, as well as pima cotton bloomers, robes and underthings by Skin. Of note in the Pink Tartan Collection is a grey crewneck knit sweater with angora content featuring a dense speckling of pewter-coloured pearls on the cropped sleeves. I am also loving a pair of slim olive wool military pants. Cargo pants that are actually slimming and feminine? Amazing. The lower level houses Pink Tartan's signature collection - identified by tailored dress shirts and riding pants - along with much of the lifestyle assortment. Booth explains that Pink Tartan's women's shirts are made in a factory that typically manufactures men's shirting. Newport-Mimran insisted on the same quality for the shirts in her collection. While Pink Tartan is a womenswear line, and the shop is decidedly feminine (pink glittery Christmas trees are visible from the sidewalk), Seventy Seven doesn't forget about men. 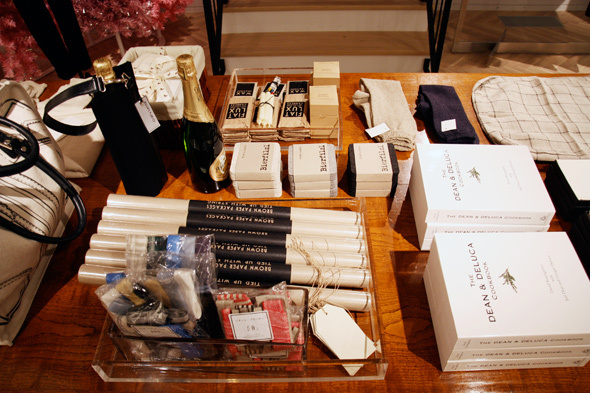 Many of the lifestyle items have a masculine appeal. 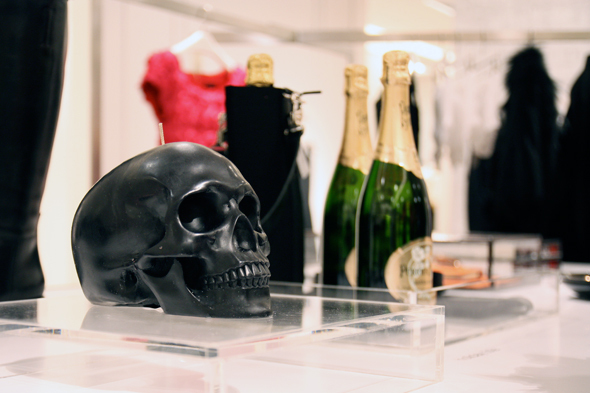 DL & Co. medieval candles and skull-print leather journals are luxury gifts with edge, while travel skincare sets, designer beach towels, and art books round out the appealing unisex gift-giving ideas. 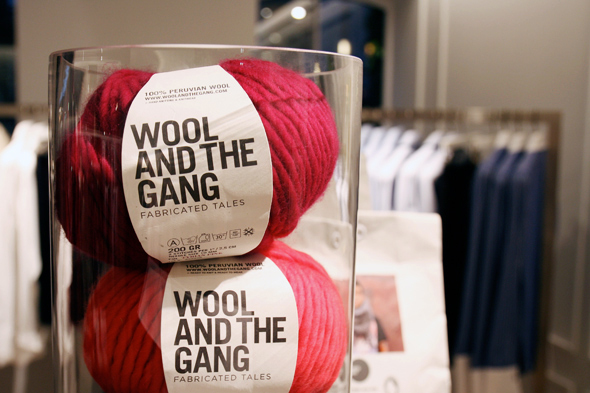 I love the Wool and the Gang scarf knitting kits, Graf & Lantz merino felt and leather totes and Alicia Adams Alpaca hot water bottle covers. 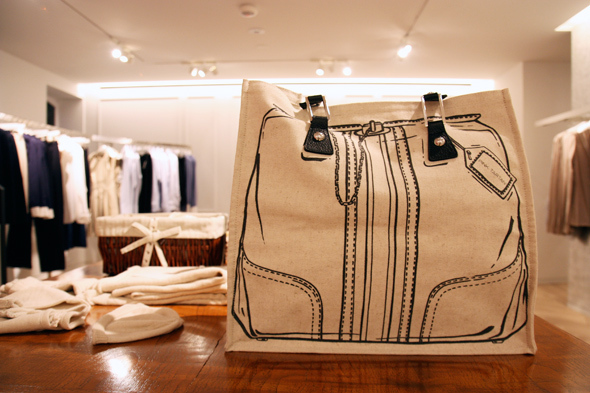 But, a screen-printed canvas Pink Tartan tote with leather handles and metal hardware is by far my biggest covet. Don't even think of wrapping any of your Seventy Seven purchases in gaudy Dollarama giftwrap, though. Newport-Mimran has you covered. Plain brown paper rolls and linen string (with a cutesy nod to The Sound of Music ) echo the simple and classic style of the Pink Tartan brand. Forget raindrops on roses and whiskers on kittens - these are a few of my new favourite things.